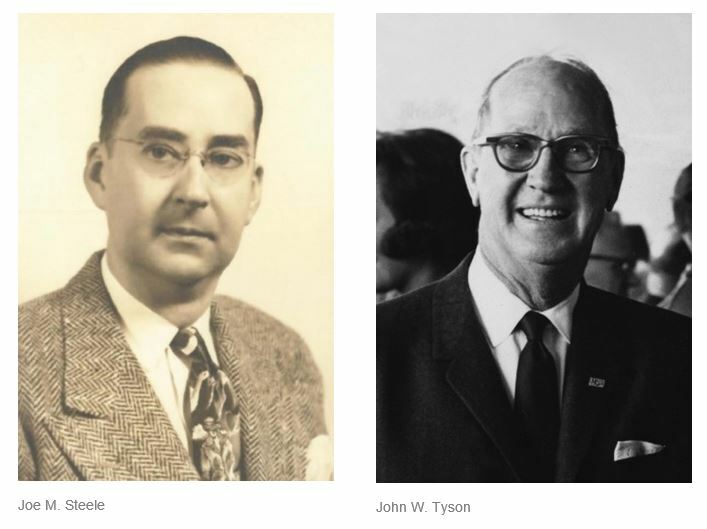 Joe M. Steele and John W. Tyson, two icons of Arkansas business and architects of Springdale’s emergence as a center for economic innovation and growth, were announced today as posthumous inductees to the Arkansas Business Hall of Fame. The two join Warren A. Stephens and Claiborne P. Deming as 2019 inductees by the Sam M. Walton College of Business at the University of Arkansas and the Arkansas Business Hall of Fame Board. Steele, a key leader behind the creation of Beaver Lake, established Steele Canning Company as a major player in helping deliver food to a growing nation’s kitchens. Tyson founded what today is Tyson Foods, Inc., a Fortune 100 company and a dominant force in protein production around the world. Stephens is chairman, president and CEO of Stephens, Inc. Deming is the board chair of Murphy Oil Corporation. Steele and Tyson join 82 other business luminaries who comprise the Arkansas Business Hall of Fame. Springdale and its neighboring communities are well represented in the Hall. Previous inductees include Don J. Tyson (2000), Harvey Jones (2000), J.B. and Johnelle Hunt (2001), Gene George (2002), Willis Shaw (2009), Leland Tollett (2011) and Buddy Wray (2015). Steele’s key role in the creation of Beaver Lake, his personal funding that led to the establishment of the Beaver Water District and his leadership that led to the construction and operation of the District’s first treatment plant are primary reasons Northwest Arkansas is one of our nation’s economic success stories. He’s best known for building Steele Canning and for his emphasis on quality and innovation. Whether providing wartime canned vegetables to the military, promoting his products as a sponsor of The Beatles 1964 U.S. tour, introducing Popeye Spinach to America cupboards in 1965, or directing Springdale’s First State Bank to become the first to make poultry loans then considered risky in the banking industry, Steele was a true entrepreneur. Tyson’s decision to haul a load of chickens to Chicago where prices were higher was a decision that eventually led to the vertically integrated company headquartered in Springdale today. Seeing beyond the current market, he began raising his own chickens, milling his own feed, and cross-breeding high-meat yield chickens with other birds – an unusual practice at the time. By 1947, his company was supplying chicks to farmers, selling feed to growers and transporting chickens to market. With a processing plant and commercial egg business to come, Tyson had almost single-handedly created the modern poultry industry. The four men will be inducted during the Hall’s annual banquet scheduled for February 8 at Little Rock’s Statehouse Convention Center.